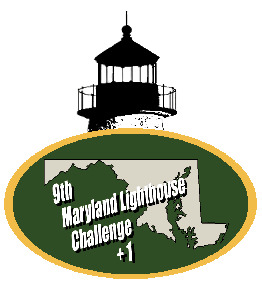 The 2013 Maryland Lighthouse Challenge +1! Blackistone Lighthouse Replica (St. Clement’s Island), Choptank River Lighthouse Replica (Cambridge), Concord Point (Havre de Grace), Cove and Drum Point (Solomons), Fort Washington (Fort Washington Park), Hooper Strait (St. Michaels), Jones Point (the “+1” - a Virginia Lighthouse) - just south of the western end of the Woodrow Wilson Bridge (Alexandria), the Lightship Chesapeake (Pier III Baltimore’s Inner Harbor), Piney Point (Piney Point), Point Lookout (Scotland), Sandy Point Shoal (Sandy Point State Park – near Annapolis) and Seven Foot Knoll (Pier V, Baltimore’s Inner Harbor). To the Challenge faithful, please note that due to circumstances beyond our control, Turkey Point will not be participating in this year’s event. Note: The BONUS lighthouse attractions (also TBA from the group above) and the BONUS cruise out of Hooper Island (cruise dates: September 19, 20 and 23) to see some of the Bay’s more elusive lighthouses are “add-on” attractions. Although they are not required stops along the Challenge route, we highly recommend them to round out your Challenge adventure, and will earn participants extra souvenirs! The Maryland Lighthouse Challenge…Making Maryland memories--one lighthouse at a time! 2013(c) Chesapeake Chapter, USLHS. All rights reserved.